Gravimetry and Gravity gradiometry is a field of science which supposedly measures the strength of the earth's gravitational field. In these discussions Gravimetry is often used as evidence that the gravitational field of the earth varies with latitude and by location. It has been found that Gravimetry is not directly measuring gravity at all. The Gravimeter devices have been described by professionals in that field as long-period seismometers that are measuring small "jerks" in the background seismic noise and interpreting it as variations in gravity. Gravimeters are, in truth, seismometers. Seismometer devices have been described as having a "gravimeter mode." 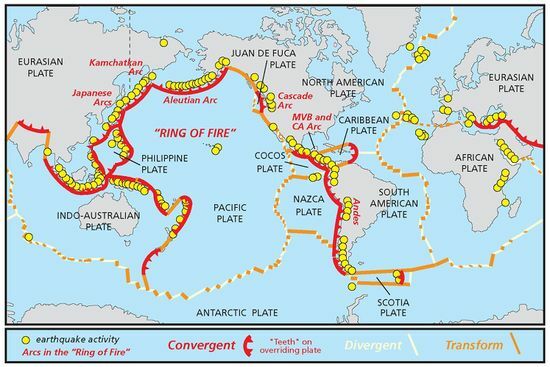 Seismometers can double-purpose as gravimeters, and can detect the "gravity tides". Gravimeters are often similarly double-purposed as seismometers to detect earthquakes thousands of miles away. 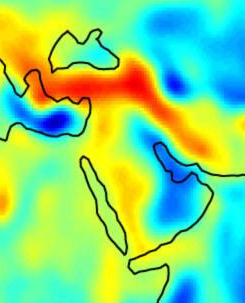 Perhaps most illustrative, gravitational anomalies on gravity maps are indistinguishable from the seismic zones. There are also several items which do not make sense with the gravity anomalies, if they were actually a measurement of mass. 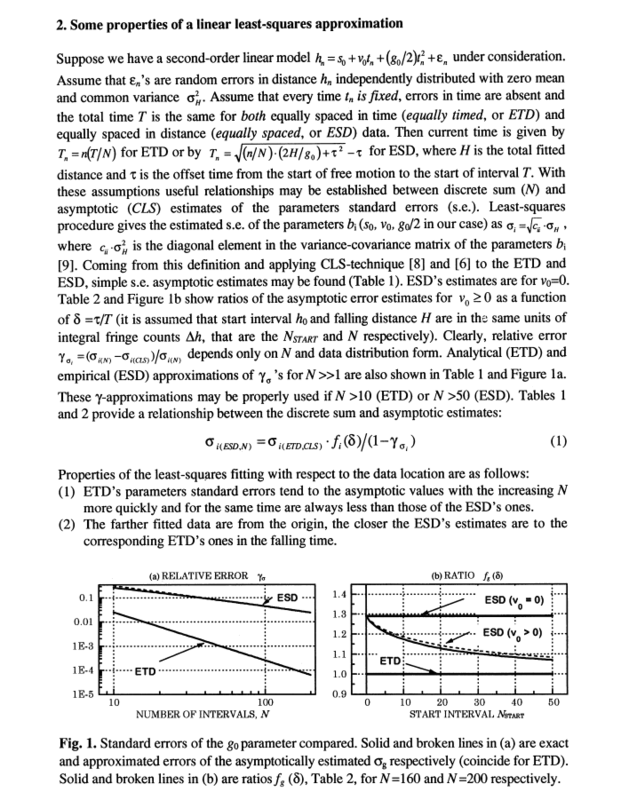 Further, the differences by latitude and altitude in the gravimetric end product data are seen to be artificial corrections that are manually added or subtracted to the data and reference model, rather than information that is from the measurements. Operators are told to make a modification for latitude, essentially inputting the variations. “ Gravity gradiometry is the study and measurement of variations in the acceleration due to gravity. The gravity gradient is the spatial rate of change of gravitational acceleration. 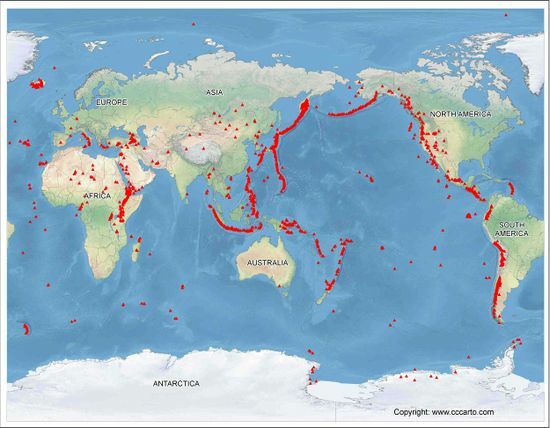 Is a study of subseismic activity a study of gravity? “ Many broadband, three axis, seismometers in common use are sensitive enough to track the sun and moon. When operated to report acceleration, they are useful gravimeters. Because they have three axes, it is possible to solve for their position and orientation, by either tracking the arrival time and pattern of seismic waves from earthquakes, or by referencing them to the sun and moon tidal gravity. The reader might ask, if gravimeters are entirely different devices than seismometers, how could seismometers have a "gravimeter mode"? Again, we see that the gravimeter is actually a seismometer, and will be easily disrupted by seismic activity and other noise. Hence, the gravimeter is a low-frequency seismometer, taking data out of those low-frequency bands. Nearly all gravity surveys use gravimeters to take their data. A gravimeter is identical to a long-period seismometer in most respects, the only difference being that the goal is to measure the force needed to center the mass, which is proportional to g.
As directly stated, the interest isn't in the total pull. The designers mainly care about using the device as a seismometer. 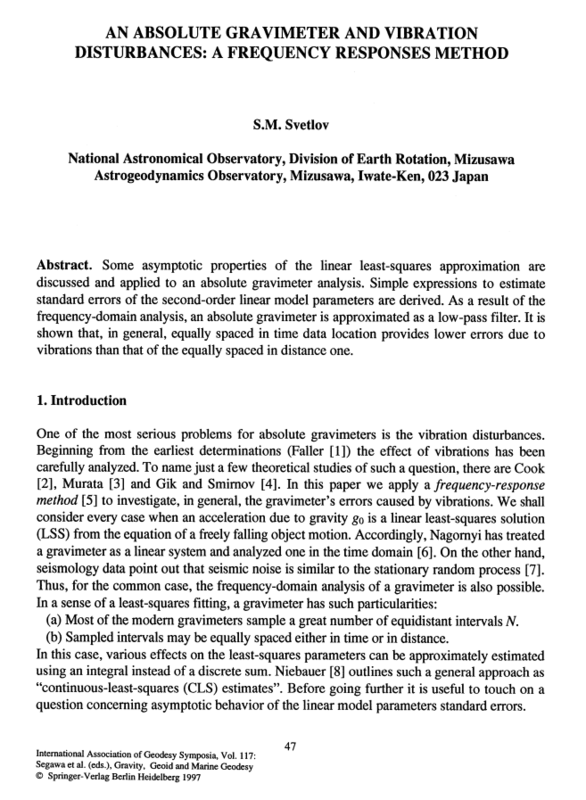 The ending two sentences of that abstract even imply that gravity meters may be superior for measuring seismic elements. The reader may ponder why the gravity of the earth would change before an earthquake. A study titled Seafloor Compliance Observed by Long-Period Pressure and Displacement Measurement (Archive) uses gravimeters to study the gravity of the ocean. On p.2, para.4 its authors call the gravimeter a long-period seismometer. “ In fluid dynamics, gravity waves are waves generated in a fluid medium or at the interface between two media when the force of gravity or buoyancy tries to restore equilibrium. An example of such an interface is that between the atmosphere and the ocean, which gives rise to wind waves. “ Infragravity waves are surface gravity waves with frequencies lower than the wind waves – consisting of both wind sea and swell – thus corresponding with the part of the wave spectrum lower than the frequencies directly generated by forcing through the wind. In line with the previous seismometer section, the tides appear on the low frequency bands. 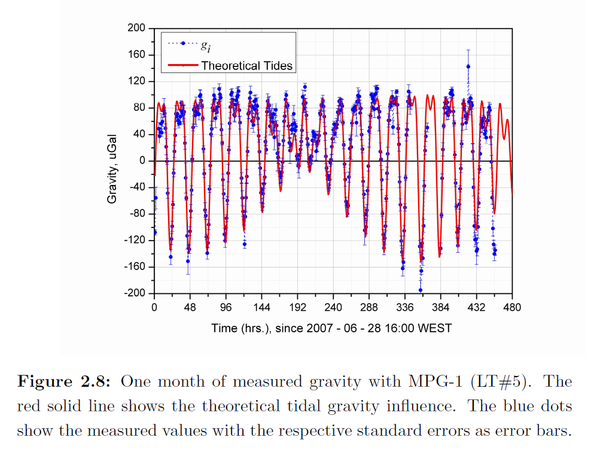 It is asserted that gravimetry has shown trends at different latitudes, and so this is validation of the idea that it is really measuring "gravity". We find that this assertion is unfounded. If the objective of gravity surveys is merely to look for deviations from a round earth reference model with the vibrating gravity theory, then the final computed number in meters per second squared would becomes meaningless for the purpose of discussion. Any modifications to the reference values are constructed on an entirely theoretical basis. “ Latitude correction: The earth's poles are closer to the centre of the equator than is the equator. However, there is more mass under the equator and there is an opposing centrifugal acceleration at the equator. The net effect is that gravity is greater at the poles than the equator. We read that we are subtracting or adding values to the reference model and the data to make the corrections for latitude, which is very different than using the data to determine the latitude. The claim that the final number is meaningful as evidence to showcase any particular point is shown fallacious. “ Latitude correction (gn) - Correction subtracted from gobs that accounts for earth's elliptical shape and rotation. The gravity value that would be observed if the earth were a perfect (no geologic or topographic complexities) rotating ellipsoid is referred to as the normal gravity. These are artificial corrections which are added or subtracted to the data and reference model. If the earth were really elliptical or rotating, and if the devices were really measuring gravity in full, then these artificial corrections would not be necessary. It is seen that the devices are seismometers and that these corrections are artificially added into the data as modifications. 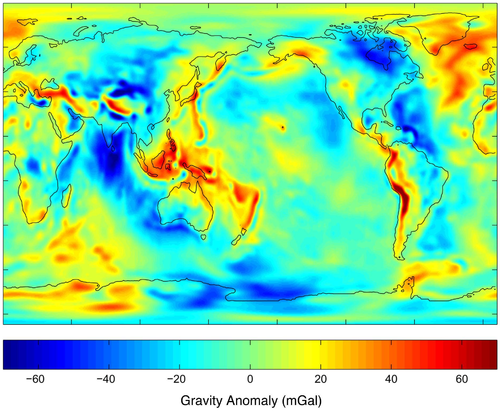 Compare the gravity anomalies (first image) to a world volcano map (second image). 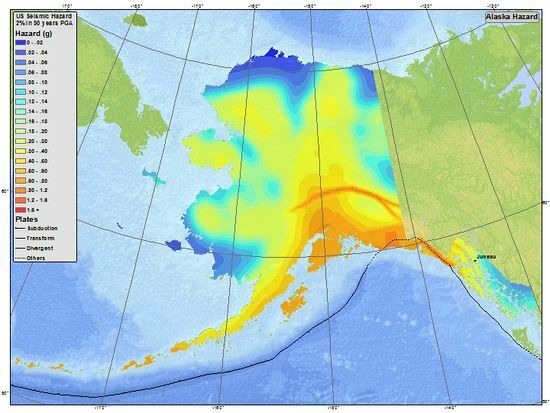 Compare the gravity anomalies to seismic hazard maps of various location. The anomalous deviations of gravity, as detected by the gravimeter, are called Bouguer Anomalies. 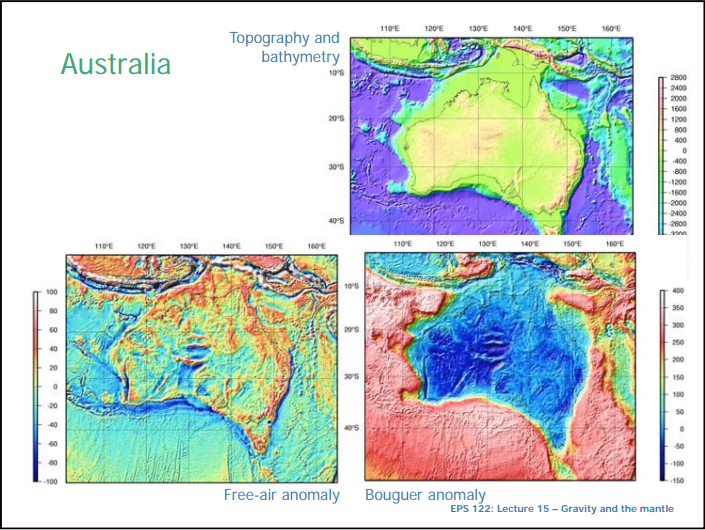 “ In geodesy and geophysics, the Bouguer anomaly (named after Pierre Bouguer) is a gravity anomaly, corrected for the height at which it is measured and the attraction of terrain. 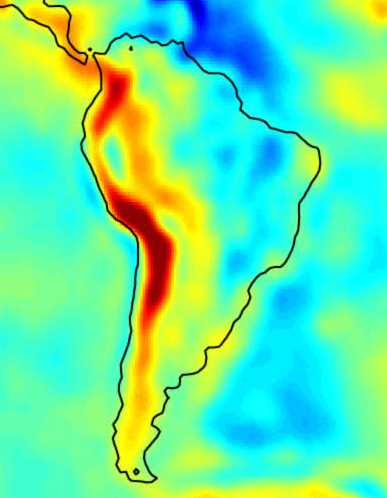 The height correction alone gives a free-air gravity anomaly. gF is the free-air gravity anomaly. Note that a correction for latitude needs to be made, and that the data is not in the gravimeter readings itself. 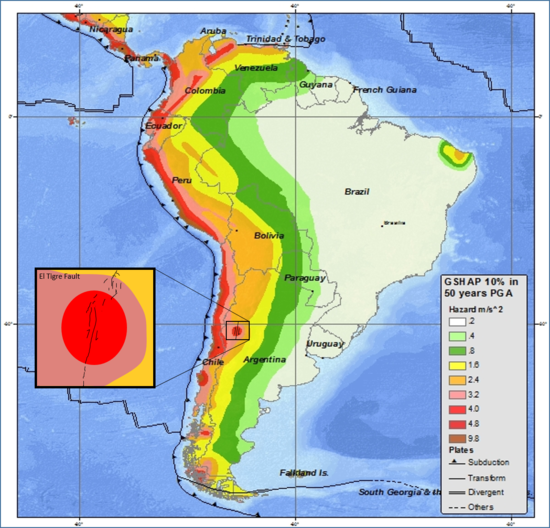 The anomalies are negative in continental areas and positive in oceanic areas. The anomalies are also negative in the mountains. These anomalies appear to go against the theory that the anomalies are due to the attraction of mass. “ This map shows the Bouguer anomalies over the whole of Germany and surrounding areas, in a detailed but still clear way. The above shows that the anomalies are negative in the Alps of Germany. 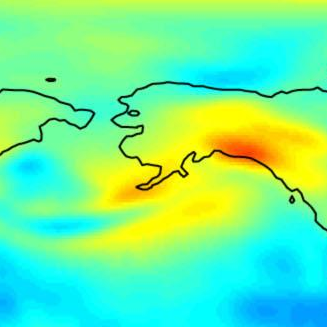 It should also be noted that seismic waves can become airborne, which would explain the ability of gravimeter devices on airplanes to register the anomalies. Q. 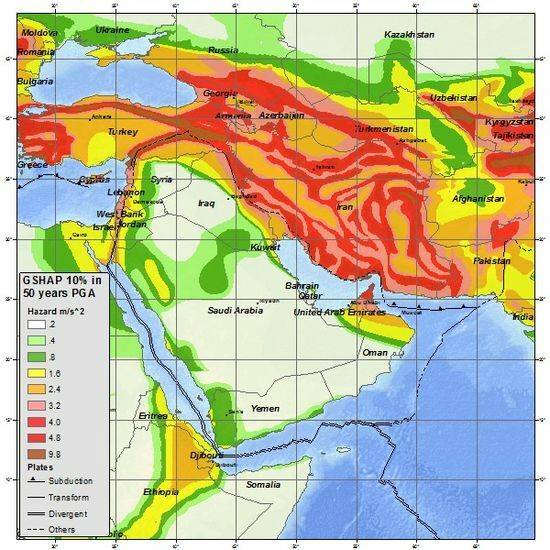 If the gravimeters are picking up background seismic activity, how is it that gravimeters can detect underground oil deposits and other structures? On analysis of the gravimeter we find its primary purpose is to measure noise and use many software algorithms to interpret and filter out the noise. Every part of the device's components—the lasers which measure the motion, the mirrors, the springs which launch the mass up and down the small tube, and all component parts—are all connected in some manner to the earth, and are subject to noise and vibrations. In the previous section, the low-pass filter is used to find the gravity from the noisy data. We can expect that the variation of gravity consists of components with long period, however the vibration of carrier with short period. If this expectation is satisfied, the low-pass filter should work well. Actually, analysis for the first observation on an observation wheel works well, though, not for the other two observations. The reason is the difference of the amplitude of the noise: it is very difficult to pick up the gravity data with very small amplitude from very large vibration of the carrier. This must be limitation of simple filtering technique. From the above we see that a need to use algorithms and filters to 'find the gravity' from noise. The levels of g are not readily apparent, and must be constructed by subtracting from the noise to 'find gravity'. The above passage states that "We can expect to find the variations of gravity consists of components with long period, however the vibration of the carrier with short periods." The reader may decide whether the process of subtracting vibrations with one characteristic to reveal other vibrations is truly measuring gravity. Why does "gravity" need to be found? We see that the process involves extensive data analysis, filtering, and clean-up from noise — to 'find gravity'. Again, we see that filtering is necessary to clean up the noise. The remainder of the document describes how the filtering occurs. All sources, to the best of the author's ability, are given an "uncertainty budget," to which is subtracted from the noise. The uncertainty budgets are estimated ranges to which a phenomenon may be contributing to the noise. All possible phenomena in nature must be considered and precisely defined. Everything from air drag, electrostatic fields, pressure, seismic vibrations, &c.
Once all of these items and their theoretical uncertainties are subtracted, we are left with "gravity". The main conclusion from this is that the tides may be related in some manner to vibration or noise that is being processed. No mechanism is presented, or is identifiable, from a long term analysis of noise trends. 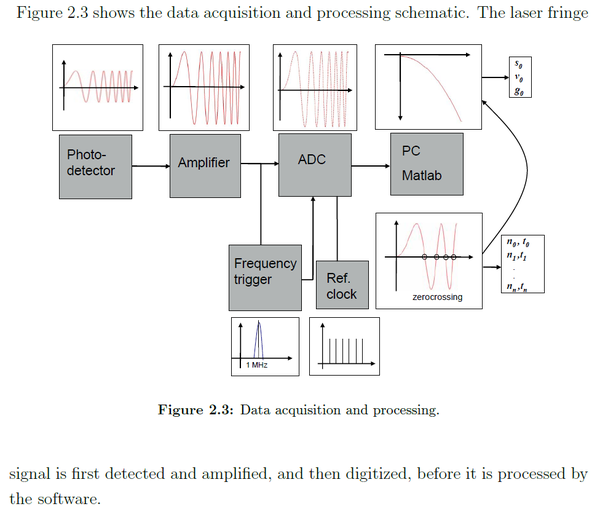 From the introduction the author states that the input is a noisy fringe signal. 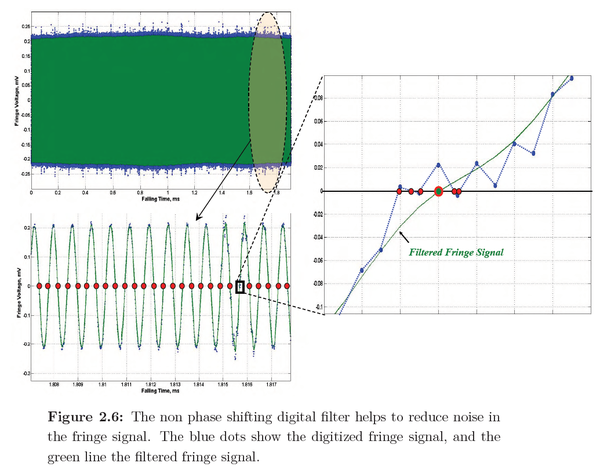 Multiple methods, functions, to "extract" the gravity value from the "noisy fringe signal." This document was written in 2010. 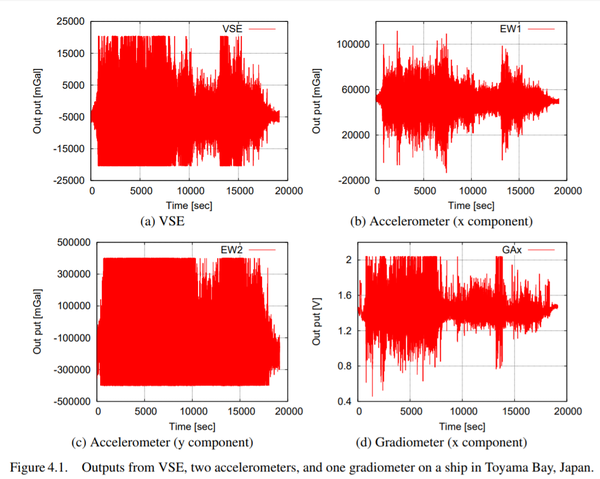 If Gravimetry were really 'direct measurement of the acceleration,' as some have claimed, then the reader might ask, why was it limited by pre-2010 computing capabilities? The answer is that it is not direct at all. It is the many algorithms necessary to interpret the "noisy" fringe signal that need large amounts of computing power. The process is interpretation of a noisy fringe signal. Uncertainty budgets, just as we saw in the earlier paper, are subtracted from the noise in the effort to find gravity. This page was last modified on 19 April 2019, at 18:00.